Hey RWYK family, we’re at it again! Thrilled to announce that Mr. Shipman’s Kindergarten Chronicles: December Celebrations by Terance Shipman has been named a Reading with Your Kids Certified Great Read. We are really excited about this announcement, you may recall Terance was a wonderful guest on our show on September 3, 2017. Terance’s book is a great book to read and share with family and friends and we are proud to introduce this little gem of a book to all our listeners. We hope you and your family enjoy reading this book as much as we did! When Dewayne, a precocious kindergartener rushes in the kitchen after school waving a letter from his teacher about the December celebration, his sister Banicia and mother help him understand what’s about to happen. An entertaining story of the wonder and excitement, join Banicia as she recalls the December celebrations in Mr. Shipman’s classroom. Mr. Shipman is their kindergarten teacher, and he makes the month of December a fun, educational, multicultural celebrations that your child will never forget! From Christmas, to Hanukkah, to Kwanzaa, Mr. Shipman shares it all with his class of delightful five year old’s and builds excitement for your child for all the things December in kindergarten can be! Dr. Terance Shipman is a 23 year veteran teacher. He spent much of his teaching career working with elementary aged students. In fact, he spent his first 11 years teaching kindergarten! He is proud to say that he built strong relationships over those years and has an incredible network of his students and their parents and co-workers that he has remained in contact with over these years. Dr. Shipman calls this ever developing network “Team Shipman”. Through Team Shipman, Dr. Shipman offers continual encouragement, leadership, and mentor-ship to his students, their families, and his professional peers. Dr. Shipman currently teaches middle school and extends membership to Team Shipman to his current students and their families, as well. Mr. Shipman’s Kindergarten Chronicles are the stories of teaching kindergarten that make Dr. Shipman smile the most when he thinks about his years teaching kindergarten. Each book in the series celebrates the male teacher, in particular the black male teacher. Acknowledging the under-representation of black men in education, Mr. Shipman presents a positive and strong black male image that children need. Through his first series of books, Dr. Shipman’s Kindergarten Chronicles, Dr. Shipman hopes to make kindergarten an exciting and anticipated adventure for students, parents, and teachers, while casting an even wider net for Team Shipman. Dr. Shipman received his Bachelor’s degree in Elementary Education from the Tuskegee University in 1992. After obtain this degree, he attended Hampton University in Virginia and obtain a Master’s degree in Elementary Education in 1994. For the next 13 years, Dr. Shipman was an elementary teacher in Atlanta Public School System. Most of his time at APS was spent as a kindergarten teacher, and in 2009 he earned his Educational Specialist degree from University of West Georgia in Administration Supervision and soon after he complete his doctoral degree at Clark Atlanta University in 2013. Since completing his final degree, Dr. Shipman has worked with middle school and high school aged students. And through it all Team Shipman is still growing! Where can you find Terance Shipman on the internet? With the holiday season comes opportunities for families to enjoy more time and books together. For those who celebrate the December holidays, the days leading up to Christmas, Hanukkah, Kwanzaa and similar holidays, are an ideal time to share inspirational stories featuring themes of love, tradition, and the true meaning of the holidays. 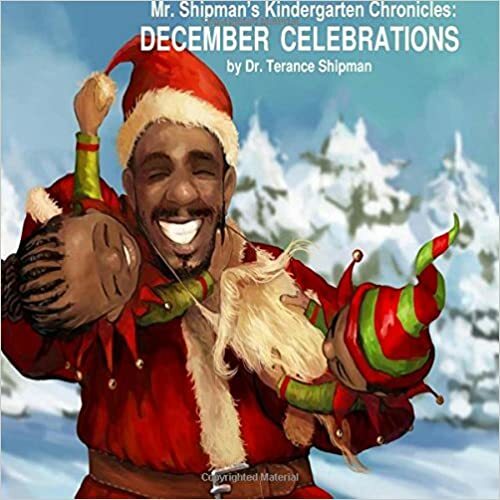 Let me take this opportunity to introduce a perfect book to enjoy the holiday seasons and that book is Mr. Shipman’s Kindergarten Chronicles: DECEMBER CELEBRATIONS by Dr. Terance Shipman. Mr. Shipman’s Kindergarten Chronicles: DECEMBER CELEBRATIONS is a sweet little book that will grab a kid by the imagination right from the start and wouldn’t let the excitement go till the very end. As I was reading the book, all the memories of my life in kindergarten including the classrooms, corridors, playground and the affection of my favorite teachers came alive. The sweet hardcover of the book shows Mr. Shipman dressed as Santa and holding his kindergarten students as they are enjoying the December holidays to the fullest, from gifts and decorations to field trips and Christmas tree. The common theme that emerges is one of affection, Tradition, diversity and the value of celebrating different cultures together. The story is told through the eyes of an innocent child, describes the exciting memories of Christmas celebrations of a young child named Banicia and her Kindergarten classmates during Mr. Shipman’s kindergarten class. As this book talks about Christmas, Hanukkah, and Kwanzaa, it introduces children to the beautiful uniqueness of many cultures, it can be used as a great opportunity by parents and teachers to show children how people around the world celebrate the same holiday in different ways. Filled with lavish illustrations, magnificent detail, and enchanting holiday scenes on every page. Mr. Shipman’s book perfectly reflects a diversity of characters and traditions that teaches kids to see themselves as part of a global world. Highly recommended for Christmas Eve bedtime reading. The lovely illustrations perfectly complement the heartwarming tale. Younger children will love the whimsical, interactive illustrations as well as the surprise gifts children received at the end. Overall, it is an exciting and anticipated adventure for younger kids and will definitely make them looking forward to school year in kindergarten! Congratulations to Dr. Shipman for winning RWYK Certified Great Read Status! A big thank you to Dr. Shipman for providing us a free copy of this book through Reading with your Kids certified program. The opinions expressed in this review are entirely our own. Read NextA True Tale of a Chicken-Duck Named Chuck!